I’ve got more than ever to celebrate these days. A lot is happening with and because of this blog. You will get the details I promise. Let me just say this – I am completely overwhelmed and thouroughly happy the way things happen right now. And just like this, I had another great excuse to treat myself with something sweet. As far as I can remenisce about treats which persuaded me the most, it was something fruity and crumbly. I could retaste an old favourite dessert just a little bit healthier. 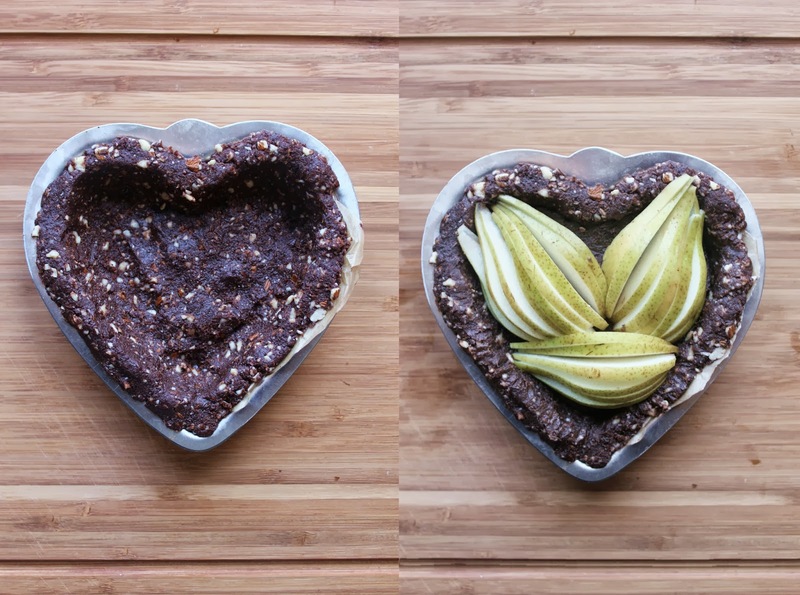 A raw cake is such a personal gain in the kitchen. Blooming with health & time saving. And a great way to create something to fully satisfy your sweet tooth. For one, the dough is a good base on which you can put any fruit you desire or the season offers. Or rolled into little balls, cut into bars or crumbled on top of smoothies. I chose pear as the main character. They are often undervalued in benefits and clouded by apples. But maybe the day has come to say – A pear a day keeps the doctor away! Some pears have more iron content than others. It can be seen by cutting the pear. when it does not turn brown it has a low or no content of iron. This can be seen by cutting the pear. When it does not turn brown you know that is has a low or no content of iron. The other key ingredient are the fresh dates. So gooey and sweet they are a treat alone. Combined with raw cacao and nuts it is such an intense rich taste, developed by whole natural ingredients. 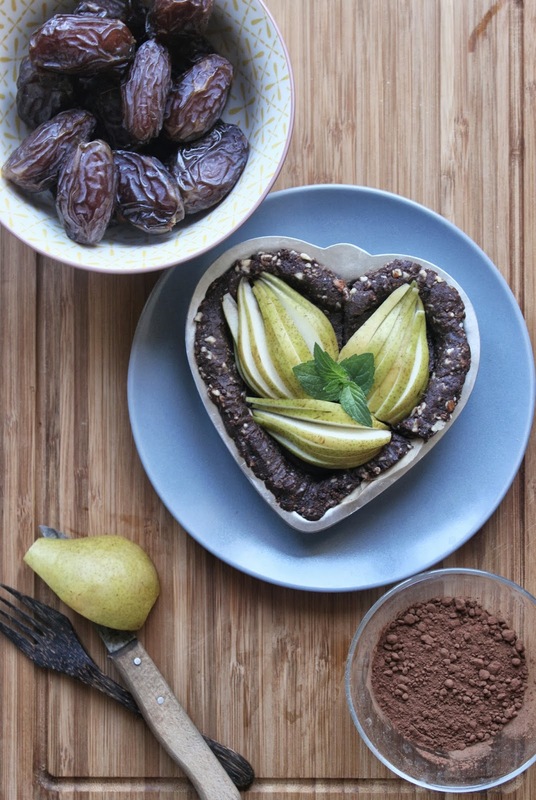 Between the dough and the fruit is a creamy date chocolate mousse like spread. Do I need to say more? Or maybe say it again – date chocolate mousse spread. Spread it on fruit, cake, bread, pancakes, cupcakes or eat it just as a mousse. The cake is perfect for two. Made just with a handful of each ingredient. I only used my hands and a fork for preparing. Meaning you won’t need fancy equipment to make this dish. 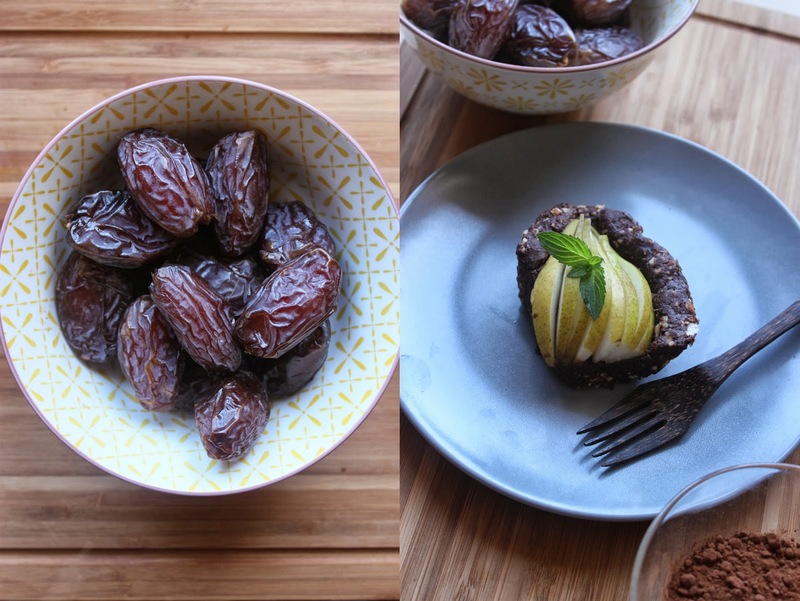 Ready in ten minutes and perfect as a dessert for a date night or as a cute little birthday cake. Take a plate and mash the dates with a fork until they turn into a thick mass. Cut the nuts into little chunks. Mix 3/4 of the dates with the nuts and 1/2 cup of cacao and the salt. use your hands to really work the cacao powder into the dough. Place the dough into a little form with a baking sheet on the ground. Now take the rest of the date mass and what is left of the cacao and mix it with the coconut oil. Spread it onto the dough. Cut the pear in thin slices, pick a few mint leaves and lay them on top of the cake. Serve directly or put it in the fridge for a few hours to serve it a little chilled. Do you celebrate with food? Which is your favourite little treat for yourself or someone loved? Tell me in the comments or meet me here & there! Yay! This looks so amazing, and so not a huge time or energy commitment. I love that. And that the recipes is so small! it's total genius. Thanks for this.